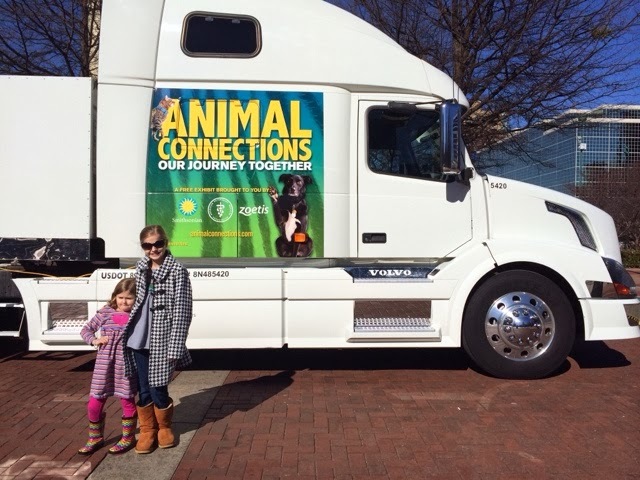 Animal Connections: Our Journey Together is a traveling exhibit on an 18-wheel truck that introduces visitors of all ages to the complex bond between humans and animals. 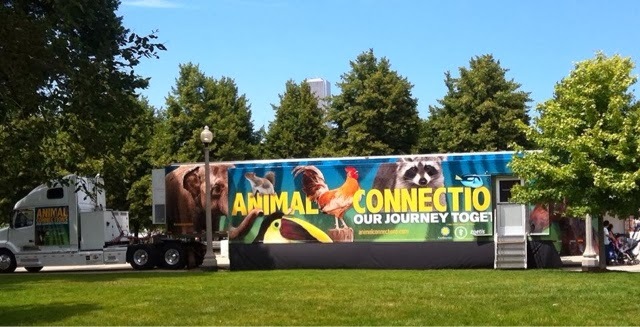 Presented by the Smithsonian Institution Traveling Exhibition Service to mark the 150th anniversary of the American Veterinary Medical Association, the project is made possible through the generous support of Zoetis, an independent company that discovers, develops and manufacturers veterinary vaccines and medicines. 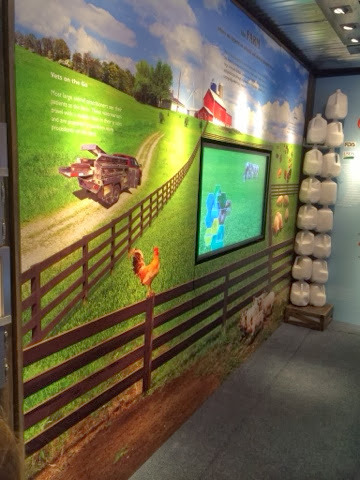 Created to inspire the next generation of veterinarians, the exhibit uses a dynamic combination of interactive learning stations, films and touch screen videos, and three- dimensional settings to explore topics about animals in the home, on the farm, in the wild, at the zoo and in the veterinary clinic! 1,000 square feet of interior space with interactive displays, video screens, games, and hands-on and minds-on activities. 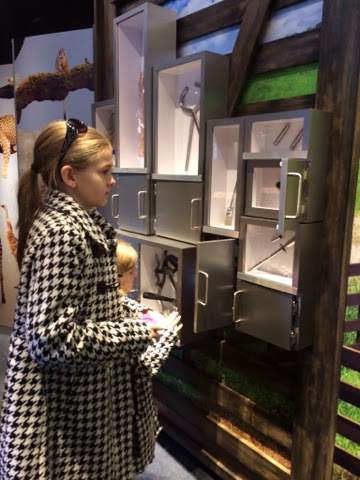 Find Your Dream Pet interactive component allows the user to answer a series of questions pertaining to the environment and care they can give a pet, and the kind of relationship they hope to have with the animal. 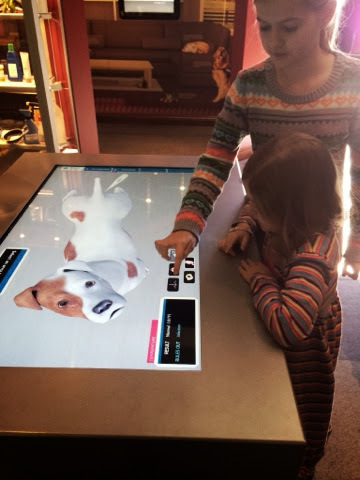 Make Your Diagnosis — At multi-user touch tables, visitors will adopt the role of veterinarian and walk through the steps of diagnosing what ails a dog, a cheetah, or a young pig that has been brought to their attention. Visitors will interview the animal’s caregiver, conduct an examination, and run tests, before making a decision about how to proceed with treatment. Five main sections: The Home, The Farm, The Zoo, The Wild and The Veterinary Clinic. This was an AMAZING Field Trip with our girls. Both our girls are Huge Animal Lovers! Emily has expressed for a long time she wants to become a Veterinarian. I think today just confirmed that! It’s hard to choose just one favorite here because we loved all of it. If we had to choose one it would be the hands on diagnosis center – Virtual Center. 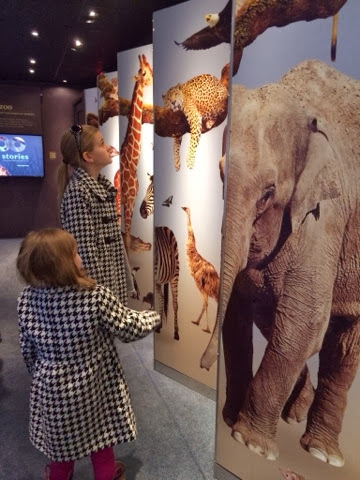 We also visited the Fernbank Museum of Natural History and Fernbank Science Center. “Learning begins outside the classroom”.